Litecoin prices ticked above $310, for an 11% gain, as Litecoin founder Charlie Lee shares his thoughts on surging crypto prices on CNBC yesterday (Dec. 14, 2017). 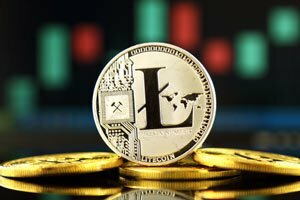 The creator of the crypto coin said he hopes Litecoin prices stay relatively stable, and he wants investors to be responsible. "Don't spend all your life savings to buy a cryptocurrency," Lee said. In Bitcoin news, the price climbed closer to $18,000 as traders ignored statements from Federal Reserve Chair Janet Yellen and threats of a shutdown to cryptocurrency trading in South Korea. Yellen joined the chorus of Bitcoin doubters this week by stating she considered it to be a "highly speculative asset." Meanwhile, South Korean financial regulators are trying to establish an aggressive set of laws aimed at reducing risks tied to the cryptocurrency market. Below is a recap of the top cryptocurrency prices at 10:30 a.m. EST. On Friday, the market capitalization of the global cryptocurrency sector hit $537.57 billion. Bitcoin comprises 55.3% of the global cryptocurrency market. Top performers from the largest 50 cryptocurrencies by market capitalization included Aeternity (up 70.12%), BitShares (up 32.60%), Stellar (up 25.93%), Komodo (up 25.12%), Cardano (up 23.91%), Binance Coin (up 21.80%), Populous (up 20.33%), and Einsteinium (up 19.44%). The worst performers from the top 50 largest cryptocurrencies by market capitalization included RailBlocks (down -11.12%), TRON (down -8.35%), Golem (down -7.18%), Lisk (down -4.89%), and Bitcoin Cash (down -4.30%). According to the Apple Inc. (Nasdaq: AAPL) App Store, twice as many people downloaded Coinbase last week as they did Instagram. The crypto exchange experienced 17,000 first-time installations last week as more and more users attempt to get in on the crypto rally. According to a survey by student loan startup LendEdu, 77% of respondents expect that the Bitcoin price will increase next year. Also, 75% of the respondents plan to increase their investments in Bitcoin. The price of Ripple has increased by more than 220% over the last seven days. Ripple has rallied thanks to the news that South Korean and Japanese banks were testing the company's technology on cross-border payments. Stellar jumped more than 25% on news that mobile messaging startup Kik will shift its token from the Ethereum network over to Stellar. On Wednesday, Kik's CEO, Ted Livingston, said that Ethereum hasn't been able to scale up to meet the needs of his organization. Livingston even took a jab at Ethereum, calling it the "dial-up era of blockchain." We've discussed some of the bullish outlooks on crypto, but the number of bears is also increasing. Today's warnings come from the real-life "Wolf of Wall Street" and one of the United Kingdom's top regulators. Wall Street Wolf Jordan Belfort called Bitcoin is a "huge scam" in an interview with CNN this week. "I think it's a huge danger right now that people are looking at this as the next great thing, it's a bubble for sure," Belfort said. Meanwhile, Andrew Bailey, the chief of the United Kingdom's Financial Conduct Authority (FCA), compared the risks of Bitcoin to the risks of gambling. Baily warned investors that they have to be prepared to lose everything if they continue to invest in cryptocurrencies. "It is a very volatile commodity in terms of its pricing … If you want to invest in Bitcoin, be prepared to lose your money – that would be my serious warning," Bailey said.